Election Related Fake News. It’s the top talk on the net. Being a Donald J Trump supporter we utilized our Facebook page to help make America Great Again! We blogged many election related articles that were shared to our Facebook page. We also created narrated screen videos that were uploaded and shared with a handful of Donald J Trump related Facebook groups. Donald J Trump promotion related Facebook Groups were humming with activity. Good posts or videos got hundreds of comments, mostly the ones that bashed ole Crooked Hillary. We also gained a lot of website clicks from our Facebook page, and page posts shared to Donald J Trump related groups. That’s the easiest way to gain traffic to a Facebook post or page. Facebook constantly bugs members to “boost this post for $5” but we never opted in to the social networks ads. We didn’t run ads here on Doc’s Place and we’re not going to enrich Mark Zuckerberg’s bank account. The dark side to this experience was the Fake News posts with catchy titles that enticed a Facebook member to click a link to an external website loaded up with ads. 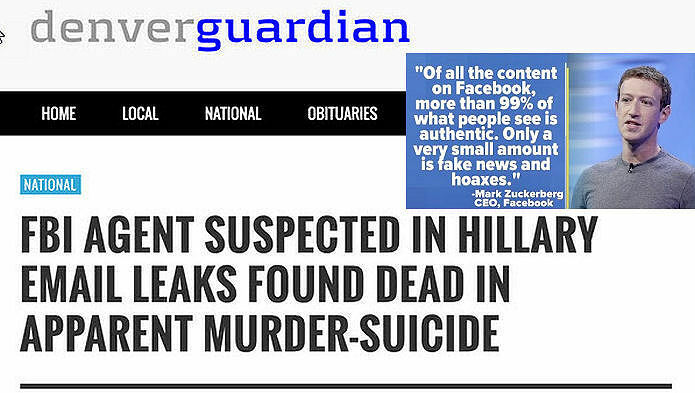 Facebook was literally infected with these fake news posts. The fake news spam was so bad we unfollowed several groups. There were thousands of these click bait websites infesting Facebook Groups loaded up with Google AdSense and other pay per click ads from other domain sponsors. One really annoying ad from adf.ly covered the sites page requiring a click to get past it. NBC News published this article about a Macedonian town where high school students were getting rich running fake news websites and sharing to Facebook. Though NBC’s article didn’t specify, most of these click bait websites were shared to Facebook groups. Domain names changed quickly as they were found out to be spam. VELES, Macedonia – Dimitri points to a picture on his Instagram showing a bar table decked with expensive champagne and sparklers. It’s from his 18th birthday just four months ago — a lavish party in his east European hometown that he says wouldn’t have been possible without President-elect Donald Trump. Dimitri says he’s earned at least $60,000 in the past six months — far outstripping his parents’ income and transforming his prospects in a town where the average annual wage is $4,800. He is one of the more successful fake news pushers in the area. NBC News also aired an article interviewing Jestin Coler the owner of denverguardian.com a WordPress website. During the NBC Interview, Coler admitted the article was fake. He also stated Google AdSense took back the many thousands earned from Denver Guardian. This was aired Friday night (11/09/16) but no record if it exists via search. NPR.org published this article uncovering it’s ownership. We bet those same click artists will be busy creating fake news articles and Google AdSense will stuff publishers pockets full of cash. For shits and giggles we took a drive over to Facebook. Just today in one group we found these click bait websites, not necessarily fake news, but for sure click bait. Lets face it – Money Talks. If Zuckerberg and Google are profiting that’s all that matters. It’s easy to deny this kind of stuff – while laughing all the way to the bank!